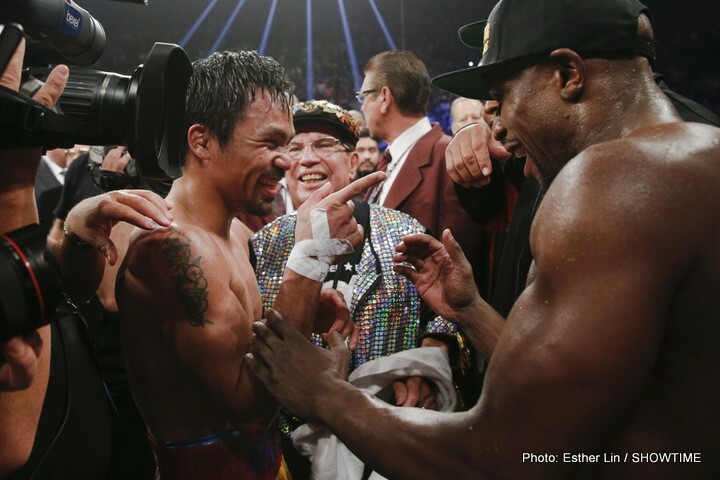 The fight may be over between Floyd Mayweather and Manny Pacquiao, but the war of words continues. Manny Pacquiao responds to Floyd Mayweather’s Instagram video full swing, in which he calls Mayweather an “ex-convict” and brings up Mayweather’s past with domestic violence. Pacquiao returns to the US this weekend to begin rehabilitation on his shoulder, in which he received surgery for a torn rotator cuff that he worsened during the May 2nd bout. He is not expected to be back in the ring until early 2016, while Mayweather is set to make his return on September 12th with Andre Berto and Amir Khan as the front-runner opponents.